Geneva, 17 November 2014 - The first global operation targeting individuals wanted for serious environmental crime, including wildlife crime, led by INTERPOL and supported by the International Consortium on Combating Wildlife Crime (ICCWC), was announced today. 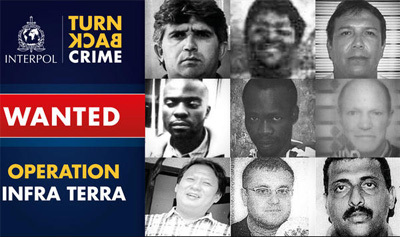 The initial phase of INTERPOL’s Operation ‘INFRA-Terra’ (International Fugitive Round Up and Arrest), is targeting nine fugitives wanted for environmental crime, in particular wildlife crime. This includes Feisal Mohamed Ali, alleged to be the ringleader of an ivory smuggling ring in Kenya. The Secretariat of the Convention on International Trade in Endangered Species of Wild Fauna and Flora (CITES) adds its voice to support its ICCWC partners in asking for the public’s assistance to provide information that could help track down the suspects whose cases were selected for this initial phase. Commenting on the operation, the CITES Chief of Enforcement Support, Mr Ben Janse van Rensburg said, “This first operation represents a big step forward in the fight against wildlife criminal networks. Countries are increasingly treating wildlife crime as a serious offence, and we will leave no stone unturned to locate and arrest these criminals to ensure that they are brought to justice. The public can play a crucial role in this collective effort, they our eyes and ears on the ground. Their support can help ensure that the offenders face the full might of the law and are punished appropriately”. ‘Historically, countries have not drawn on these law enforcement tools to hunt down fugitives wanted for offences against our natural heritage. The CITES Secretariat applauds the governments that are making use of this mechanism and strongly support this initiative to combat wildlife crime and the kingpins behind it,’ he added. Wildlife crime has become a serious threat to the security, political stability, economy, natural resources and cultural heritage of many countries. The extent of the response required to address this threat effectively is often beyond the sole remit of environmental or wildlife law enforcement agencies, or even of one country or region alone. This operation, targeting fugitives, will extend efforts beyond national borders and across range, transit and destination States in support of a collective global response to fight such crime. Technical and financial support for the operation is offered by the International Consortium on Combating Wildlife Crime (ICCWC) thanks to the generous contribution of the European Union. Information on the possible location of the targets of Operation INFRA-Terra, or any internationally wanted persons, can be sent to INTERPOL’s Fugitive Investigative Support unit. Information can also be given anonymously to any national “Crime Stoppers” programme. CITES was signed in Washington D.C. on 3 March 1973. The United Nations General Assembly has proclaimed 3 March as World Wildlife Day.